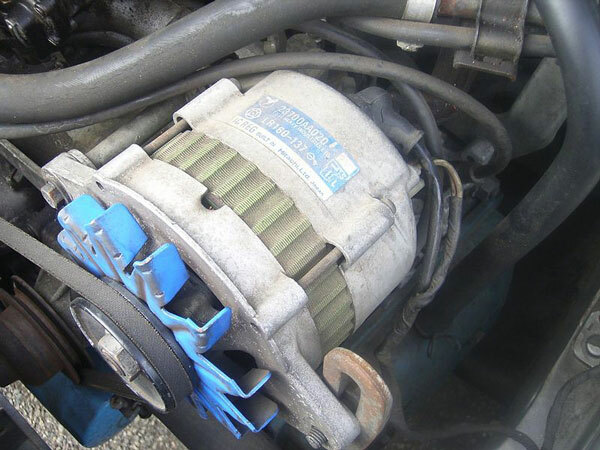 An alternator is a vital part of a car’s charging system and under the bonnet equipment. It works alongside the battery to generate power for the car’s electrics, such as the lights and dashboard display. You’ll find one near the front of the engine, driven by the rotating crankshaft which converts the up and down movement of the pistons into a circular motion, thus generating electricity. An alternating current (AC) is produced by the alternator which then channels electricity into the battery and enables it to run. The alternator is bolted to the engine using special brackets, one of which is adjustable to tighten the drive belt. Because the battery and alternator work so closely together, it can be difficult to spot which one is causing the problems when the car won’t start. It’s also easy to think that the battery is the problem when the battery sign flashes up on your car’s dash. One way to check this is to jump start the car. If, once the jump leads are removed, the engine dies shortly after, then it’s more likely that it’s your alternator causing the problem, as it’s this which provides the regular supply of power for the battery. Light flickers on the dashboard which is shaped like a battery or says GEN (generator) or ALT (alternator). Unusual smell of burning rubber as a result of friction on the belt. Smell of hot wires – due to problems with the wires, cables or connections. Growling/ whining sound coming from under the bonnet. While it’s a fairly straightforward component, it’s easy to see why the alternator plays such an important role in the running of your vehicle and that’s why, when it stops working, you aren’t going anywhere fast. The reason why early warning stages might include the warning light going on and off, is because the alternator may be able to only provide the power for a certain amount of functions, such as your lights, but once more demands are put on it, that’s when it falters. This is also the reason why, when several accessories which rely on the AC power are used at the same time, they might not work as effectively as usual – and you might get dimmer headlights, for example. Things normally start to not work as well in order of priority. The heated seats or the radio may be one of the first things to go (these are obviously less important than the headlights, for example). When alternator problems are presumed, a mechanic should also check the belt which helps run the alternator to check for proper tension, any cracks, wear and tear. If you’re having problems with your alternator and looking to buy spares we can help. Get in touch and enquire with a member of our team for more information.